This tagged female wolf was captured in late fall 2010 by ADF&G researchers and weighed 70 pounds - counting the two-pound GPS collar. If you’re looking for the biggest wolves in Alaska, head to the Fortymile country. That’s where legendary Alaska wolf trapper and hunter Frank Glaser caught a 175-pound male in the summer of 1939, the largest wolf ever documented in Alaska. Glaser trapped the wolf on the Seventymile River near Eagle. “They run some big wolves in that country,” state wildlife biologist Craig Gardner, who spent 20 years working in the area while stationed at Alaska Department of Fish and Game in Tok, said. While the wolf Glaser caught had a belly full of meat, Gardner captured a 140-pound male with an empty stomach in 1997 when the state was sterilizing wolves as part of a recovery plan for the Fortymile Caribou Herd. The wolf was the alpha male in a pack of 16 wolves. “He was just enormous,” Gardner said. Wildlife biologist John Burch of the National Park Service caught a 148-pound wolf in 2001 near the Yukon Charley Rivers National Preserve. A female with him weighed 110, Burch said. Burch has caught one other wolf over 140 pounds — a 143 pounder 10 years ago — and four that were over 130 pounds, including a 132 pounder last year. “Any wolf over 140 I would classify as huge,” Burch said. 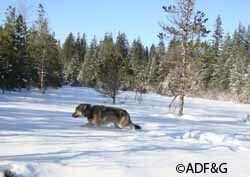 The average weight for an adult male wolf in Alaska is about 100 to 110 pounds while females average about 90 pounds. The biggest wolf in most packs almost always are the alpha males, biologists said. “If you catch an alpha male out of a pack that weighs 120, that’s representative of a big, fully grown adult,” said biologist Mark McNay, who spent half of the 27 years he was at the Alaska Department of Fish and Game studying wolves before retiring in 2007. During his career at Fish and Game, McNay captured and weighed more than 300 wolves. The biggest was a 143-pound male he caught in the Alaska Range in 2003. That wolf was the alpha male in a pack of 16 and was coming off a fresh kill, he said. The biggest female McNay has ever caught was a 118-pound wolf in the late 1980s, which he captured in the same area as the 143-pound male in 2003. The alpha male in that pack weighed about 125 pounds. “They were in exceptionally good territory that had lots of moose and caribou,” McNay said. 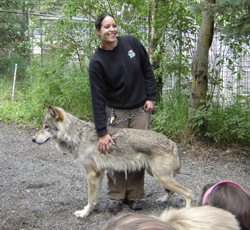 A full-grown wolf provided (as a pup) to the Alaska Zoo by ADF&G, with handler Stephanie Hartman. The zoo reports their captive wolves weigh between 95 and 120 pounds, depending on gender and when they last ate. Most of the wolves in Alaska are what McNay referred to as “moose wolves” because they rely on moose for the bulk of their food in winter. Caribou are not as widely distributed as moose or as predictable in their movements as moose. Wolves also eat Dall sheep, a few birds, a few beaver; salmon, and other animals when available,” McNay said. Based on several studies of wolf kill rates, a wolf consumes an average of about 5 to 15 pounds of food per day in winter. Wolves kill mostly calf moose. Yearlings are the next most favored age class. It is interesting that wolves rarely kill a moose between the ages of 2 and 7 years. Then moose become increasingly vulnerable until all female moose are dead by the age of about 18 years of age. “The weights of wolves fluctuate greatly depending on food availability. Wolves can eat 20 pounds of moose or caribou in one meal if it’s available. Wolves “can pack away a lot,” McNay said. “If I caught one that was 143 pounds and it hadn’t eaten for a couple days it could be the same size as a 170-pound wolf coming off a fresh kill,” he said. Other biologists agreed wolves are extreme opportunists when it comes to food. “If they have the opportunity to eat a lot they will,” Burch added. “A very large male collected by Frank S. Glaser, July 12, 1939, on 70-Mile River, approximately 50 miles from its mouth in extreme east central Alaska, weighed 175 pounds,” Young wrote. “It was the heaviest that has been taken by any of the personnel of the Fish and Wildlife Service.” The 140 pound wolf that Gardner weighed in 1997 came from the same area. There also is mention of a 172-pound male with a stomach full of meat caught in the Northwest Territories in 1947 and a 157-pound wolf shot on the Savage River drainage in the Alaska Range in 1934. An interior wolf. 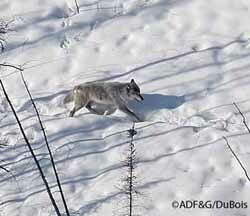 Biologists report that male wolves in Denali National Park average 105 pounds. The wolves Burch handles in the Yukon Charley Rivers National Preserve are bigger than the wolves he dealt with working in Denali National Park and Preserve for 10 years. According to his figures, males in the Yukon Charley run about 5 pounds bigger than Denali Park males and females are about 2 pounds larger. Of the 179 wolves Burch has captured in and near the Yukon-Charley Rivers National Preserve since 1993, the average weight for adult males is 111 pounds and for females it is 97. Boertje and Garder weighed 71 male wolves older than yearlings in the Fortymile herd’s range and the average weight was 106 pounds. Of the 300 or so wolves that biologist Layne Adams with the U.S. Geological Survey has handled working in Denali National Park and Preserve and Gates of the Arctic National Preserve, the biggest was a 135-pound male in Denali. Adams still remembers the size of the wolf as if it were some kind of mutant. Most trappers don’t weigh the wolves they catch because they skin them in the field, said Al Barrette at Fairbanks Fur Tannery. Even if they did weigh them, chances are they would weigh less than those handled by biologists because they’ve been in a trap for several days, he said. Barrette weighs about 50 wolves per year that trappers bring him to skin and the biggest he has ever weighed is 128 pounds. This article by Tim Mowry/tmowry@newsminer.com (459-7587) first appeared in the Fairbanks Daily News-Miner on Dec. 29, 2010, and has been republished with permission. Thanks to Rod Boertje for additional edits.